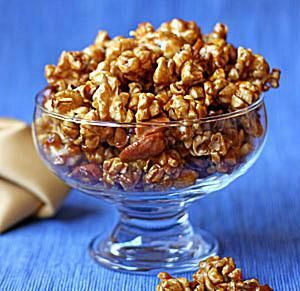 This recipe for caramel popcorn produces golden popcorn with a crunchy, sweet caramel coating. This candy is delicious on its own, or you can try Chocolate Caramel Corn for an even more decadent treat. 1. Pop both bags of microwave popcorn, and empty them into a large roasting pan, or two 9x13 pans. You should have about 24 cups of popped corn. Remove as many unpopped kernels as you can. Turn the oven to 250 degrees, and place the popcorn in the oven to keep warm. 2. Place the butter, sugar, and corn syrup in a medium saucepan over medium heat. Stir until the sugar melts, and continue to cook, stirring, until the butter is melted and the candy begins to boil. 3. Stir in the condensed milk, and insert a candy thermometer. Continue to cook the mixture, stirring occasionally, until the candy reaches 238 degrees. Remove it from the heat, and stir in the vanilla. 4. Take the popcorn out of the oven and carefully pour the caramel over the popcorn, stirring it so that the pieces are evenly coated. 5. Return the popcorn to the oven, and bake it for about 45 minutes, stirring every 10 minutes. If you use multiple pans and your popcorn is in a single layer, the cooking time will be closer to 25 minutes. It is done when the caramel mixture darkens and bubbles all over the pan. 6. Remove the popcorn from the oven and allow it cool completely at room temperature before breaking it into pieces by hand. Store caramel popcorn in an airtight container or bag in a cool, dry place.